Former developers working on Sony's The Last Guardian have started their own indie studio based in Tokyo, Japan made up of an international staff. Friend & Foe, as the studio is named, is hoping to self-fund and self-publish the two projects it currently has in development: Vane and Dangerous Men. "As many before us, however, we grew tired of working for big companies and chose instead to bet it all on pooling our talents and set out on the great indie adventure we always wanted," the official website's mission statement reads. "We're now at a point where we're ready to start showing our projects to the world. We really hope you enjoy the ride and see what we get up to!" It's first game, Dangerous Men, is a cartoonish beat 'em up inspired by 80s buddy-cop movies, and it will primarily be released for iOS. Detectives Dan and Don must work together using laser-sighted pistols and massive explosions to rid the town of a group called the Punk Gang. Looks silly and like a lot of fun from the bit of footage the devblog has. On the other hand, Vane is obviously the team's priority project. It's a much more atmospheric and seriously toned game, something you'd expect from The Last Guardian staffers. It focuses more on exploration as you play as a young child with a mysterious power trapped on what looks like a vast desert planet. Giant ruins and rock formations scatter the horizon, and frequent lightning strikes hammer the ground around him. It the storms don't kill him, then perhaps heat exhaustion after it clears up will. It will be released for the PC "when it's done," as the game's release date reads. Aside from The Last Guardian, Friend & Foe is also comprised of AAA veterans with Bionic Commando, Battlefield 3 and Killzone all to their names. Best of luck to getting your business off the ground, and who knows? 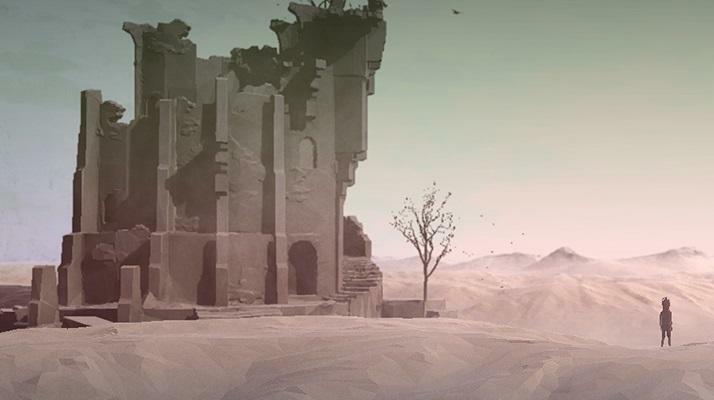 We might even be playing Vane before we even get mention of The Last Guardian again.